Módulo 2. O Vinho. | The Wine. Vinhos Tintos e Vinhos Brancos: Apenas uma diferença de tipo de uvas? Quando nos deparamos com um vinho tinto e um vinho branco, uma diferença entre eles é óbvia: a cor… Normalmente o vinho tinto é feito com castas tintas e o vinho branco com castas brancas. Mas será só aqui que reside a diferença entre estes dois tipos de vinhos? Serão, de resto, feitos da mesma maneira? Não! A vinificação – conjunto de operações de transformação das uvas e/ou seu sumo em vinho – de vinhos tintos é diferente da vinificação de vinhos brancos! Este quadro permite-nos perceber que, logo de início, se bifurca a metodologia de vinificação entre brancos e tintos. Analisemos pois, fase a fase, todo o processo de vinificação. 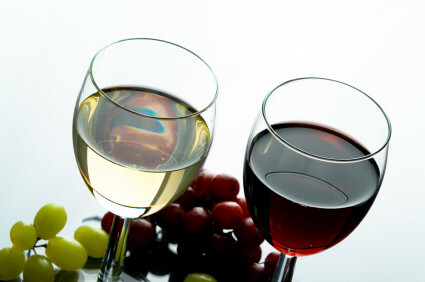 Red Wines and White Wines: Does the difference consist only in grapes kind? When faced with a red wine and a white wine, a difference between them is obvious: the color ... Usually, the red wine is made with red grapes and white wine with white grapes. But that´s not the only difference between these two types of wines. In fact, they are not even made the same way. The red wine vinification - set of transformation operations of grapes and/or its juice into wine - is different from white wine’s one! This scheme allows us to realize that the methodology of winemaking bifurcates at the beginning. Let us analyze, thus, the entire winemaking process, stage by stage.